With the warmer weather now with us, at long last, you’ll have noticed that radiators are now being switched off in workplaces, hospitals, hotels, schools, colleges and universities; in fact, most other places used by large numbers of people. However, the demand for hot water remains throughout the year for washing and cleaning, and of course, let’s not forget, for leisure and swimming. For organisations striving to cut their heating costs, along with their carbon footprint, Combined Heat and Power (CHP), otherwise known as cogeneration, has emerged over the last few years as the preferred solution for organisation with demands for large volumes of hot water. So as we approach the holiday season and more and more of us frequent the nation’s resorts and their swimming pools, imagine how they might be heated. 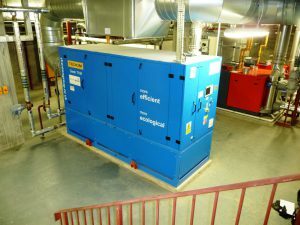 Being the sole UK and Ireland distributor of Tedom Combined Heat and Power Systems, shentongroup has been at the forefront of the CHP movement, installing solutions of all sizes and that operate on a range of fuels, including cheaper, greener biogas. 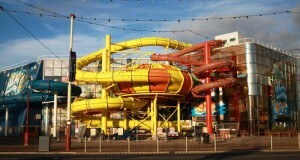 When Blackpool’s Sandcastle Water Park was approaching the limit of available mains power and was being faced with increasing energy costs and the uncertainty of National Grid reserve power levels, it turned to shentongroup. We delivered a CHP solution on time and on budget, comprising a very capable 200kWe natural gas-powered Combined Heat and Power system that, not only provided independence from the National Grid, but also brings with it significant energy savings and also allows for business expansion. You can read case studies here. and are entitled ’When is chp the right renewable energy choice’ and ‘Design and operational considerations for CHP systems’. For any further questions surrounding your project and how to make CHP work for you, click here to speak to a member of the UK’s Leading Technical Experts in Standby Power, Uninterruptible Power Supplies and Combined Heat & Power Systems.